mimsys G is a xeno-free polysaccharide which forms hydrogels suitable to study cell response in a real 3D environment. It is easy to handle, encapsulate and culture mammalian cells within the mimsys G hydrogels. mimsys G is biocompatible and nutrient permeable, suitable for long term 3D cell culture. mimsys G hydrogel mimics the hydrated microenvironment of a tissue´s extracellular matrix. 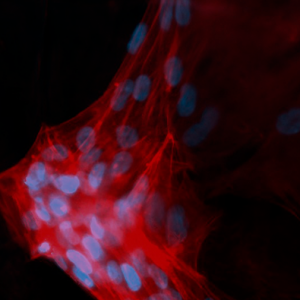 The transparency of mimsys G hydrogel makes it suitable for established laboratorial cell assays, such as microscopy evaluations, viability protocols and histological procedures.